AN 11-YEAR-OLD girl from Rathoe has just been presented with an award in an international art competition that was inspired by the Book of Kells. Talented Isobel Webb, who’s in fifth class in Rathoe NS, was picked out of 1,600 entrants in the Trinity Book of Kells Creative Competition to be presented with a special merit award. The competition was broken into three age groups – primary school, post-primary school and adult – and in two categories: art or creative writing. The theme for this year’s competition was animals that featured in the world-famous book, so Isobel fixed her artistic gaze on the lion, horse and eagle, which all represent certain chapters in the Book of Kells. 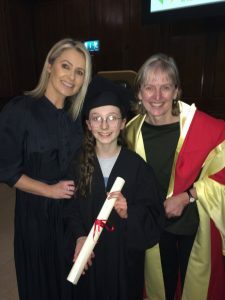 Last Wednesday, all of the winners were invited to the famous Long Room in Trinity College Dublin, where they were kitted out in gowns and mortar boards before being presented with their certificates by newscaster Sharon Ní Bheolain and Professor Rachel Moss, who lectures in art at Trinity College. “Isobel was thrilled with it. She was messing that she got into Trinity at the age of 11! But it was a huge honour to be selected, she was really delighted with it,” laughed her mother Simone, who’s also an artist. Isobel’s older sisters Rebecca and Sophie have represented Co Carlow in art in the Community Games.